Warning: This week’s column is iffy. 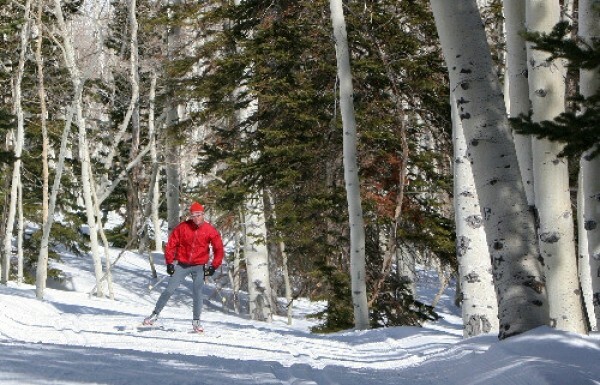 If the projected storm drops a few inches of snow, and if the Wasatch stops hitting near-record temperatures, and if you want a fat-burning workout that’s both aerobic and anaerobic—it’s still possible to go cross-country skiing. There’s not much else you can do outdoors right now. This is the mud season—when resort snow turns slushy in the afternoon, and trails are still too wet for mountain biking or hiking. It will either snow more or dry out, but until we learn what’s coming, skinny skis offer the best available outdoor workout. There are side-by-side trails along the Nordic Center—one for classic track skiing, and the other groomed for skate skiing. “You’re in the midst of towering trees, so it’s pretty shady and the snow stays pretty firm up there,” Como says. Nordic-skiing tracks are measured in kilometers rather than miles, so the winding 20K of trails measure roughly 12 1/2 miles of fairly easy terrain. Groomed Nordic trails are also much less expensive than a resort lift ticket. A day pass for the Nordic Center is $17; a half day is $12. Solitude’s rental store is in the Silver Lake Lodge near the Brighton store, where the road starts to curve around leading to Brighton. It’s a short walk to scenic Silver Lake, which is surrounded by the groomed track. Rentals vary in price from $18 to $11 for either classic or skating skis, and include skis, poles and boots. The manager at the Silver Lake Lodge, former Olympian Aram Hajiyan, will be glad to offer you tips for either classic or skating technique. A two-hour lesson costs $50. The Nordic Center lives up to its namesake; you’ll definitely find wilderness solitude on skinny skis. Another popular place for cross-country skiing is Park City. White Pine Touring (1790 Bonanza Drive, 435-649-8710, WhitePineTouring.com), the biggest Nordic rental center in PC, offers skis, boots and poles for either classic skiing ($16) or skating ($20), as well as group lessons that include both the day pass and rentals for $45. But according to White Pine’s Desiree Lindemann, it’s too late to take advantage of groomed wilderness isolation in Park City this year. If you want distance rather than isolation, Park City offers the most mileage. There’s 23K of track managed by White Pine Touring, with another 40K offered by both Park City itself and the adjoining Basin District. That’s nearly 40 miles of track that meander through nearly flat and easy terrain that takes you past the landmark “white barn,” through golf courses and beside flowing creeks. Another area that may still have snow, if only in spots, is Millcreek Canyon. It’s also the least expensive place for cross-country skiing, at just $3 per car, no matter how many skiers are in the car. The “gate” to the track is about 4 1/2 miles up the canyon; just turn off your engine in the parking lot and head out. However, the Millcreek trails are only groomed after a storm. Gatekeeper Bert Christensen says, “One place where there’s still plenty of snow is Grandeur Peak, if you have the stamina to get there, but that’s a pretty big effort.” Call the Millcreek tollbooth at 801-278-5260 and ask Christensen for snow conditions.